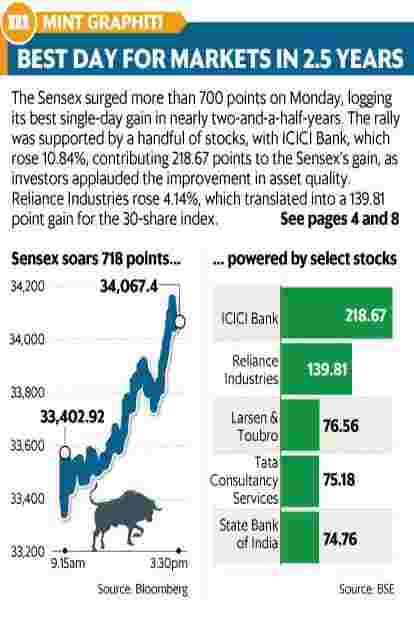 Mumbai: The BSE Sensex logged its best single-day gain in nearly two and a half years on Monday as positive earnings announcements boosted a handful of stocks, aided by firm European markets. The benchmark 30-share index rose 2.15%, or 718.09 points, to close at 34,067.40 points, its biggest single-day gain since 25 May 2016. The National Stock Exchange’s (NSE’s) 50-share Nifty climbed 2.2% to close at 10,250.85 points. ICICI Bank shares surged nearly 11% on Monday, contributing the most to the Sensex and pulling up other bank stocks. However, stocks are expected to remain volatile ahead of upcoming state assembly elections, which may provide a window to popular mood before 2019 Lok Sabha elections. Global developments and currency movement will also be watched closely. “The market was very light with many investors sitting on cash after trimming positions earlier. The fall in the last couple of months was savage, and the first signs of stability attracted value buying," said Ajay Bodke, chief executive and chief portfolio manager at brokerage Prabhudas Lilladher Pvt. Ltd.
“Crude is somewhat settled, and rupee has recovered from lows. The government’s monthly goods and services tax (GST) collections are expected to cross ₹ 100,000 crore ( ₹ 1 trillion). The improvement in macro seems to be reflecting in the markets," said Bodke. According to Bodke, if Nifty can manage the momentum, it can test 10,500 points. However, volatility may continue ahead of 4 November, the deadline US has set for India to end Iran oil imports, and upcoming assembly elections. “Currently, downside risks seem to be limited as long as crude oil prices are stable," added Bodke. Foreign institutional investors (FIIs) continued to be net sellers, offloading a net of ₹ 2,230.79 crore of Indian shares on Monday, while domestic institutional investors (DIIs) continued buying, purchasing a net of ₹ 2,526.90 crore, provisional data from National Stock Exchange showed. Private lender ICICI Bank jumped 10.84%— the most in a year —on improvement in asset quality and contributed the most to the gains for Sensex. “Barring the tepid profitability, it was a quarter full of positives for ICICI Bank as the uptick in growth and NIMs (net interest margins) sustained. Robust fee growth, curtailed costs and lower provisions led to a strong operating performance despite the treasury loss," HDFC Securities’s analysts said in a note. “The pullback in asset quality and uptrend in coverage were inspiring," HDFC Securities’s note added. ICICI Bank’s results buoyed other bank stocks as well, with State Bank of India and Axis Bank Ltd gaining 8.04% and 4.96%, respectively. “With ICICI Bank earnings, there is optimism that all corporate banks may see improvement in asset quality," said Bodke. Reliance Industries Ltd followed with a 4.14% gain. Drug maker Dr Reddy’s Laboratories Ltd rose 5.44% after it posted a 70% jump in second-quarter profit on Friday, aided by new product launches. Among sectoral indices, BSE Healthcare index and BSE Realty index gained the most, rising 4.21% and 3.77%, respectively. Market breadth was positive with gainers beating losers in the ratio of 2.3:1 on the BSE.